But sometimes, it’s more powerful to say no. Saying no frees up the ability to say yes in other areas. Saying no to service might allow you to give better prices. Saying no to some options can result in an easier interface on your website. But saying yes to everything is a path to mediocrity. Let me use a few examples to clarify. Some of the top retailers in Temkin’s Customer Experience ratings are Sam’s Club, Amazon, and Nordstrom’s. While all are retailers, their approaches couldn’t be more different. Each says no to something different on their way to that great experience. Sam’s Club is almost brazen in what they don’t allow. Don’t try to use your Visa card, and you can’t buy one tube of toothpaste. Forget personal service. By focusing on bulk items, self-service and limited tender, they can focus on what is important to their customers – lower prices. And it’s not just Sam’s Club – BJ’s and Costco are just behind them in the ratings. Amazon goes even further into self-service. They obviously say no to physical stores. But try to get personal service from the company. I hear they have good service, but I’ll be darned if I can find it. While I have actually spoken with a service person once, it took a lot of work. No, despite owning Zappos, Amazon doesn’t lead with customer service. They lead with a great interface, terrific product selection, and discounts. And that’s a very successful strategy for them. Trying to be all things to all people just makes you mediocre. Look at Best Buy, trying to give the best service while matching the lowest prices. Where has that gotten them? Poor service and no differentiation. How about Macy’s? Do they compete with Nordstrom’s or JC Penney’s? I seriously can’t tell. I shopped there this week. The fixtures and look say high-end retail, but it’s hard to see them behind all the clearance and sale signs. While these are retail examples, the same concept plays out in the every industry, including B2B services. You can’t say yes to everything, and saying no to one item frees up cash flow to fund your focus areas. 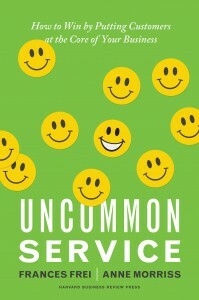 I was reminded about this when I read the book Uncommon Service. Great Clips CEO Rhoda Olsen gave me the book when I interviewed her a few months back. When a CEO gives you a book, you read it. And it’s terrific. So pick up the book and then go say no to something. Your customers will thank you for it. Does your customer or employee come first? Answer: Yes The Metrics that Matter – Does Measuring Customer Satisfaction Pay?